Meet at our accommodation – Hotel San (Tivat Bay) front terrace at 6.30pm for the pre-trip briefing followed by a welcome dinner at the hotel. Before breakfast we walk down to the hotel beach for a short acclimatisation swim. Following breakfast, we take a short boat ride for the first swim in the Gulf of Kotor. We start the 2 km swim at Drazji Vrt village and swim towards the town of Perast. You have a chance to experience the remarkable scenic views of the fjord surrounded by imposing, rugged mountains. We dock for lunch in Perast, the old Venetian town where you can walk around and enjoy the old stone architecture. A great number of historical monuments have made Perast a UNESCO listed World Natural and Historical Heritage Site. Before we start the second swim we film your stroke for later video analysis at the hotel. Before our afternoon swim we first stop at the “Our Lady of the Rock” island. The island with its church has a rich history and you can walk around and explore. 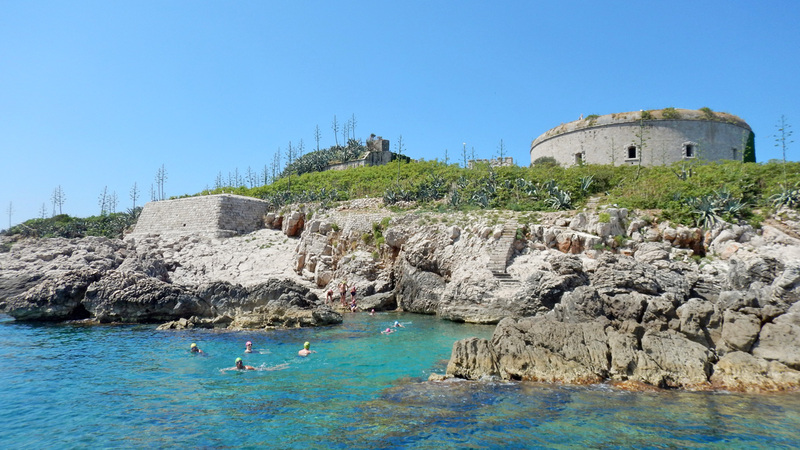 Afternoon swim is from the island towards Risan, a small town at the end of the bay. Boat drive back to the hotel. Our second day is spent part in Risan bay, part in Kotor Bay. We start our morning swim at the end of Verige area (navigational crossing between the two bays) swim coastal towards Kostanjica village on the left. On the right hand side you enjoy the stunning mountainous views of Risan bay. For lunch we stop at Donji Stoliv´s church, Gospa od Andjela (Lady of Angels) and then we take a walk along the old village path up the hill to Gornji Stoliv’s church. 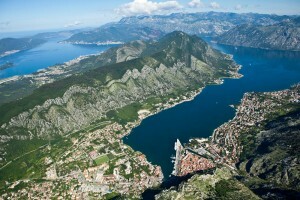 Once we reach the 230m high vista point we take in the superb views of Kotor and Risan bays. A great photography spot. Our afternoon 2.5 km swim takes us from Donji Stoliv church towards the town of Prcanj in Kotor bay. Boat drive back to the hotel. 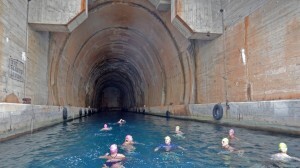 Today is the first Adriatic day as we head out to Mamula island and submarine tunnels. Boat takes us from Tivat bay straight to the Mamula island where we do our first swim. 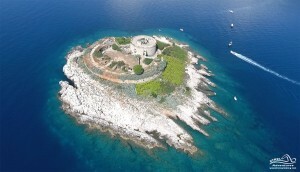 We swim two loops of the island which is about 2km in total. Afterward we explore the island by foot where you can see the impressive fortress and infrastructure that was used during the WWII as a concentration camp. The fortress was built by Austro-Hungarians in 1852 and it originally served as a strategic guarding point at the entrance of Kotor bay. Lunch stop in the beautiful coastal town of Rose. cannot swim through, but you can swim to the end and back. We finish the 2.5 km swim after the second tunnel and just before the old Yugoslav Navy ship no.21. Boat drive back to Tivat. Today we head out to the Blue Cave on the Adriatic, locally know as Plava Spilja (Blue Grotto). 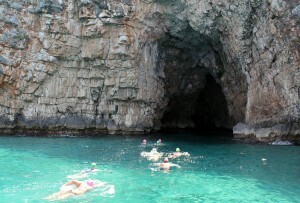 We pass the Mamula island, Azra fortress and start our first swim right at the Blue cave. Colours in the cave offer us an incredible start for our swim. We follow the high cliffs along the coast, swim in and out of several small coves until we reach the Veslo bay. Swimming in the crystal clear water of the Adriatic is a great experience! For today’s lunch we stop at Zanjice bay along the Lustica Peninsula. 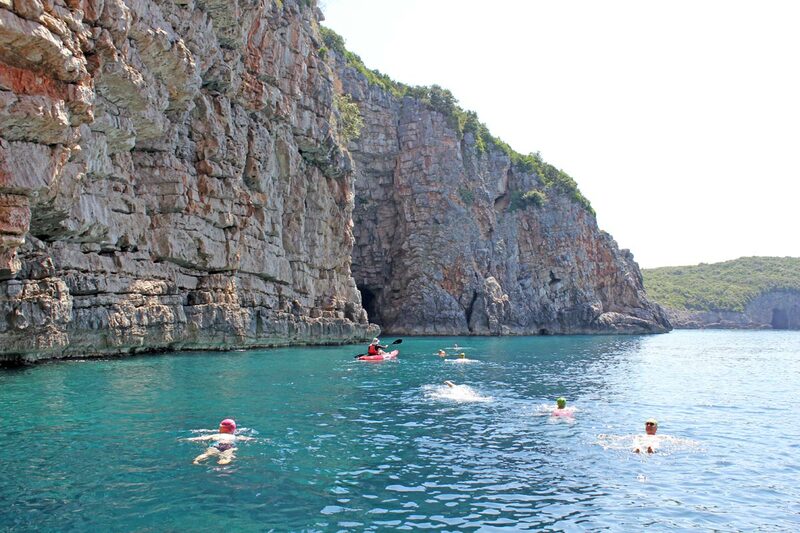 Our second swim takes us from Zanjice bay to the beginning of Rose village. 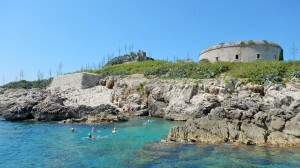 Swimming alongside the green peninsula in clear blue sea is just how you want to end up a great day. Return back to the hotel. Final dinner at the hotel. Before breakfast we have a final swim in Tivat bay in front of the hotel at around 8.30am, trip finishes at around 10.30am. 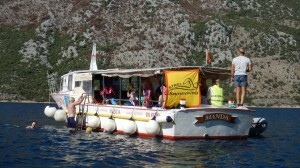 Visit and check out more details on Montenegro swimming holidays.